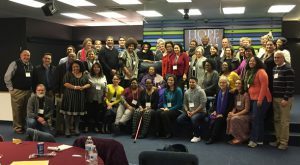 Hope for the Future is a unique gathering in that it brings together leaders of color and white leaders who work and serve in MCUSA agencies, institutions and organizations, to intentionally focus the work of intercultural transformation in the church. While it’s primarily focused on the agencies, institutions and organizations of MCUSA, the hope is to eventually impact all parts of the church. 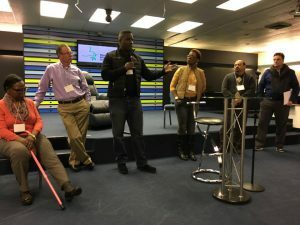 This gathering grew out of needs being felt by people of color in church-wide leadership positions who continually encounter systemic racism in a multiplicity of ways. This year, the sixth Hope for the Future gathering took place February 2-5, 2017 in Hampton, Virginia. Approximately 75 persons gathered from across the United States. Persons of Native American, African American, Asian, Hispanic, and other backgrounds as well as Swiss, Germanic, Dutch, and other ethnicities were present. 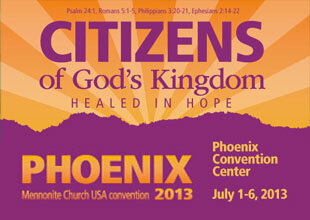 The theme of this year’s gathering was “Doing Kingdom Work”. 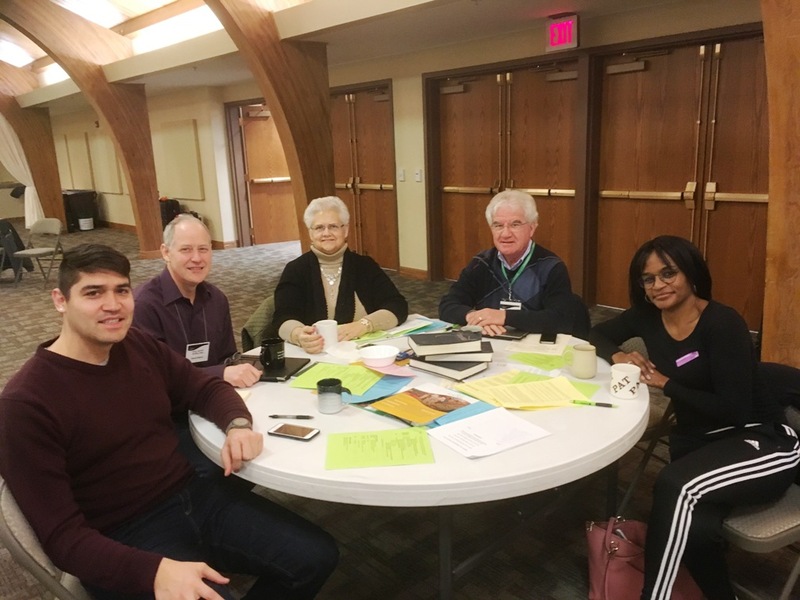 Carlos Romero, Executive Director of Mennonite Education Agency and member of the Hope for the Future planning committee, framed the work for the weekend stating, “We have come together for such a time as this,” speaking to today’s political climate. These tensions felt today are not new. In the 1970’s, when there seemed to be momentum among people of color in leadership within the denomination, most of the positions of people of color were eliminated under what was called “restructuring.” This led to a handful of leaders of color in the Mennonite Church feeling the need to meet for mutual support and counsel. When other leaders of color became aware of this gathering, they voiced an interest in participating in such a forum/conversation. Out of this grew Hope for the Future. 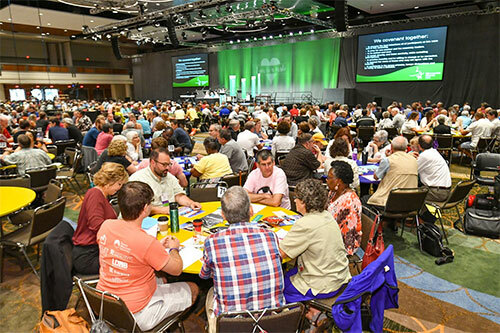 To gather as a worshiping community of faith to discern what the Holy Spirit is saying to the church through the leaders of color within Mennonite Church USA system. 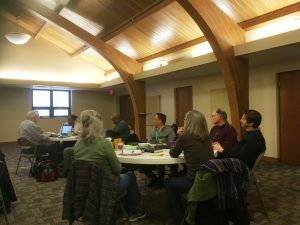 To provide a safe setting to assess the present reality and experiences for leaders of color within Mennonite Church USA system. 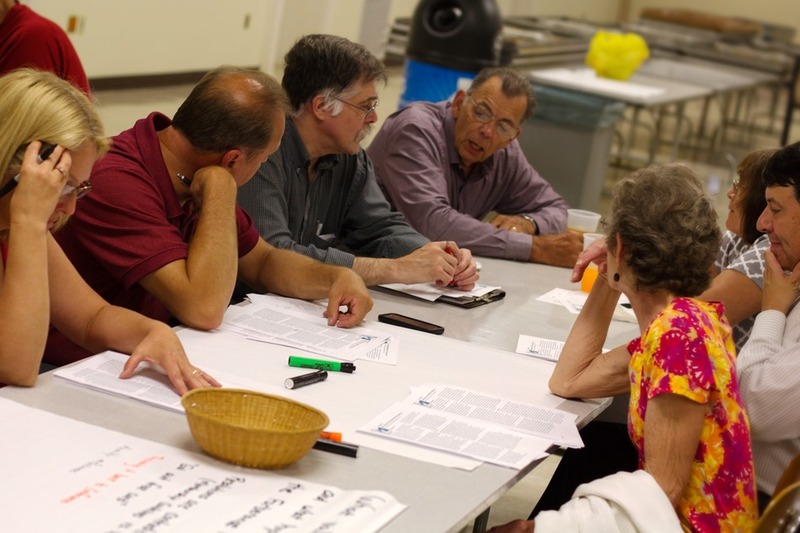 To put forth a plan/strategy/call for deepening awareness and ownership of the ongoing transformation of Mennonite Church USA. To collect learnings from leaders of color to create a forum to bring about the next level of transformation for Mennonite Church USA. To not have history repeat itself it is important for both people of color and the white culture, to be intentional about inviting and retaining people of color. Hope for the Future allows space for discussion on how various things impact people in different ways. This year, discussions focused on what it means to be a peace church in consideration of the lived reality of people of color in this country, how to monitor and change when policies are being implemented inconsistently, and visioning for Hope for the Future. Because of the work being done through Hope for the Future since 2011, this year’s gathering also called for reporting by MCUSA agencies, institutions and organizations on their progress on policies and practices that address the hiring and retaining of persons of color within their respective organizations. While much progress has been made, there is still much to do. Hope for the Future is not a one-time event, gathering, conference or what have you. It is about the lived experiential realities people of color encounter on a day to day basis in our church. 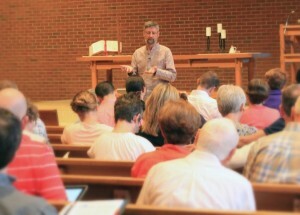 Our hope is that the ‘kin-dom’ of God will come on earth, in our church, as it is in heaven. To this end, we hope for the future! 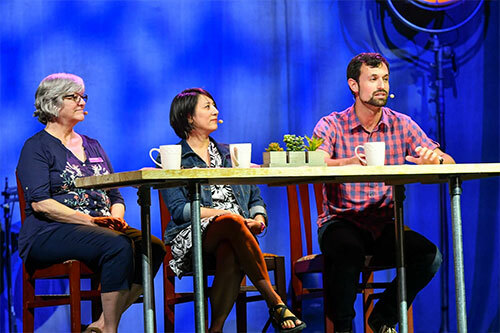 For more about the 2017 gathering, check out Hope for the Future: Together For a Time Such as This, in The Mennonite. So, how does Ervin do that? 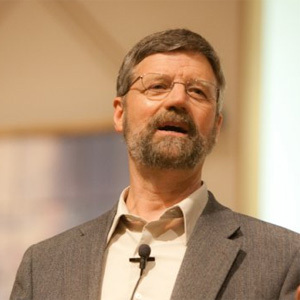 Ervin Stutzman, Executive Director for Mennonite Church USA, will be the guest speaker at this year’s assembly: God@Work, November 10 at Penn View Christian School in Souderton, Pa. Recently, Eric Bishop, a member of Souderton congregation and teacher at Christopher Dock Mennonite High School, sat down with his friend Merrill Moyer, who has worked with Ervin for a number of years on the Mennonite Church USA Executive Board, to learn more about Ervin’s life and ministry. Ervin R. Stutzman is Executive Director for Mennonite Church USA. Before taking on this role in January 2010, he served for nearly 12 years as Dean and Professor of Church Ministries at Eastern Mennonite Seminary, Harrisonburg, VA. He has also served the Mennonite Church in the roles of pastor, district overseer, missions administrator, conference moderator and, from 2001 to 2003, as moderator for Mennonite Church USA. Ervin was born a twin into an Amish home in Kalona, Iowa. After his father’s death a few years later, his mother moved the family to her home community near Hutchinson, Kan. Ervin was baptized in the Center Amish Mennonite Church near Partridge. Later, he joined the Yoder Mennonite Church. 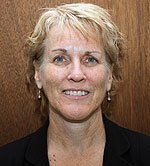 Ervin married Bonita Haldeman of Manheim, Pa. Together they served for five years with Rosedale Mennonite Missions in Cincinnati, part of that time in voluntary service. 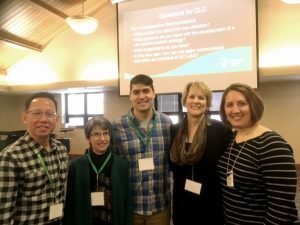 Ervin was ordained to serve as co-pastor of Mennonite Christian Assembly. From there, the Stutzmans moved to Pennsylvania, where they were members of the Mount Joy Mennonite Church. They currently live in Harrisonburg, Va.
Ervin is a preacher, teacher and writer. His Herald Press publications include Being God’s People, a study for new believers, Creating Communities of the Kingdom (co-authored with David Shenk), Welcome!, a book encouraging the church to welcome new members, Tobias of the Amish, a story of his father’s life and community, and Emma, A Widow Among the Amish, the story of his mother. Ervin enjoys doing woodworking projects in partnership with Bonita. They have three adult children, Emma, Daniel and Benjamin. Part of Ervin’s Life Purpose Statement reads: In response to God’s love expressed in Jesus Christ, by the power of the Holy Spirit, I purpose to follow after God with all my heart so that God may be glorified in my life at all times and in every way. Stutzman’s approach to leadership reflects his desire to get to know the people he serves. An entrepreneur himself, Stutzman has a special respect for business leaders who are known for their organizational dynamics and their ability to provide direction for those they are charged with leading. While on his many road trips as Executive Director, he makes special efforts to meet with area business people for them to share their view of the church, and teach him about effective leadership and management. Moyer calls Stutzman a “visionary thinker,” one who is also able to “translate that vision into something that people can understand.” Though he has offices in Elkhart, IN and in Newton, KS, Stutzman chooses to keep his residence and home office in Harrisonburg, VA, a choice that Moyer suggests helps the Executive Director to resist the “beltway mentality” that can easily form inside those two centers of Mennonite Church administration.